Every great crime film contains a "live wire", a character that is unpredictable in his both his words and actions. He automatically injects any scene he's in with unbearable tension. Many times, his capacity for violence is established fairly early on, within a single scene or moment. These moments often strike like lightening and leave a lasting impression. The character becomes the embodiment of all that polite society fears: the randomness and unfairness of life represented by a random killing or a stray bullet. Most people wish to live their lives without coming in contact with such types. People hate being at the mercy of those who both impulsive and violent. 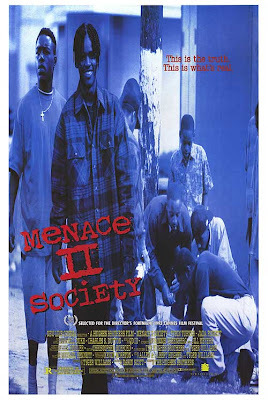 The Hughes Brothers' inaugural film, Menace II society, came in the midst of two great pop culture phenomenons of the 1990's. One was the second wave of west coast gangsta rap initiated by The Chronic, which firmly established that sub-genre as the dominant form of mainstream rap music. The other was the cycle of "Hood" films which dominated black cinema for much of the 1990's. The music created a world that was sold as being steeped in the harshest of reality, and introduced a mostly middle class fan-base to a side of the African American experience that image conscious blacks would rather stay hidden. 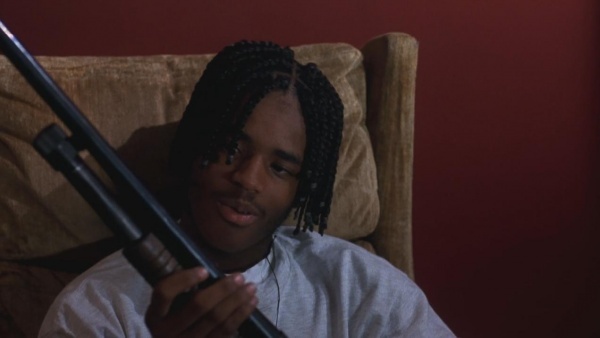 "Hood" films provided a visual companion to the music, pairing the content of gangsta rap with the intoxicating images of cinema. Boyz N The Hood, while celebrated in its day, was hardly the definitive cinematic embodiment of the sentiments expressed on the albums released by Ice Cube, Compton's Most Wanted, and Spice-1. 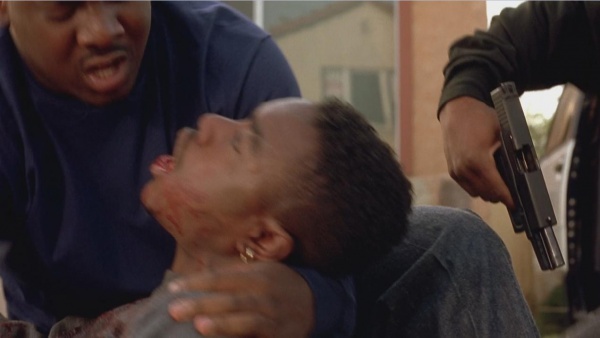 'Boyz' actually served as the jab to the death blow that was Menace. It's 1993. In the Watts section of South Central Los Angeles, Caine (Tyrin Turner) has just graduated from High School. What should be a meritorious occasion is regarded with a shrug. Caine has more important things to attend to. While some of his classmates will be entering college, the workforce and the military, Caine will continue along his present path: hand to hand crack sales, petty crimes, drinking malt liquor and chasing young ladies. The murder of his cousin Harold (Saafir) during a car jacking that takes place after they leave a graduation party sends Caine's life spiraling further out of control. 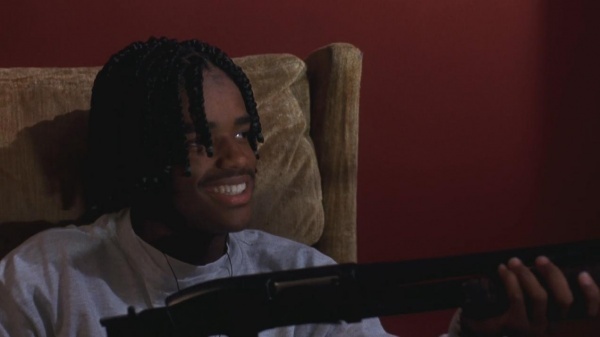 Accompanied by O-Dogg (Larenz Tate) and A-wax (Mc Eiht), he takes vengeance on his cousins killers. The fact that he feels numb after doing so makes him realize that he is capable of much worse than hand to hand drug sales. Amidst this misery, Single mother Ronnie(Jada Pinkett) takes a liking to Caine. She is hardworking with a bright future, and encourages Caine to change for the better. Alas, his life choices up until that point have made it impossible for him evolve. Caine isn't exactly innocent, but he remains highly sympathetic nonetheless. Much of this is due to the barely containable powder keg that is O-Dogg. His dress code is the traditional garb of an L.A. gang banger: flannel shirts, wife beaters, sweatshirts, sagging khaki pants and house-shoes. His forehead is obscured by a curtain of braids. To say his worldview is myopic would be an understatement. In an environment where only the wolves survive, O-Dogg is the fiercest of cubs. Were he to challenge the alpha male for pack dominance, the alpha male would likely cower. The older generation likens proficiency with fisticuffs as the true test of a man's mettle. Obviously, no one ever bothered to explain this O-Dog. He lets bullets fly with the same reckless abandon that kids throw punches in a schoolyard brawl. For him there is no middle ground. Any slight, whether real or perceived, is punishable by death. The solutions to any and all problems are final, and exceedingly brutal. As the android Ash from Alien might say, O-Dogg has no "delusions of morality". He dismisses the connection that many black folks have to religion as useless. Why bother worshiping a God that would disregard his beloved creations and leave them to live in squalor on earth? He also balks at Caine's reluctance to open fire on Harold's assailants in the presence of senior citizens and children. Avenging the murder of a homie trumps respect for elders or protecting the innocence of children. O-Dogg is a predator if their ever was one. He will stalk his prey in front of any audience, young or old. That they may be scarred by the brutality of his attack is of no importance to him. O-Dogg is amused by the sight of his own handy work. In a bravura moment that shocked audiences into uneasy silence, he commits a murder not even 5 minutes into the film. While stopping to buy 40 ounces of malt liquor from a Korean grocer, O-Dogg and Caine are stalked by an the grocers suspicious wife. Upon paying for their beer, the grocer makes the mistake of uttering condolences for O-Dogg's mother. Enraged, O-Dogg pulls a Glock 9mm and blows his head off. Caine, taking a swig of his 40 with his back turned to the ruckus, is startled by the gunfire and drops the bottle. O-Dogg, as if falling back on training received in some para-military academy, immediately grabs the grocers screaming wife and rushes her to the back of the store while ordering Caine to clean out the register. After murdering the the wife and retrieving the security tape, O-Dogg flees the scene with Caine. Thus ends one of the most shocking opening moments in film history. The shocks don't end there. O-Dog's indifference to human life knows no bounds. He expresses amusement with his own handiwork, viewing the security tape over and over like the highlight reel of his favorite ball player. That the tape is hard evidence that links both him and Caine directly to a robbery/homicide does not stop him from passing it around to be viewed by all. For O-Dogg, murder is not only an occupational hazard, but a hobby and a form of entertainment. It's Something to do in the midst of boredom, a fit of anger, or to be a spectator to. One gets the sense that the make believe violence of movies and television would not be enough to appease his appetite for destruction. He gleefully corrupts those around him. He goads Caine into violent revenge, resorting to homosexual derision at the slightest hint of hesitance. He is willing to offer Ronnie's son a taste of malt liquor in her absence. He does show a fierce loyalty to Caine, but it ultimately proves futile. When Caine lies bleeding to death in Stacey's arms in the closing moments of the film, O-Dogg stands over the two of them with his emptied Glock in hand and tears streaming down his face. His quickness on the trigger and hotheadedness was not enough to save his friend from becoming the casualty of a drive by. He stands motionless, like a lost little boy in a crowded department store clutching his favorite toy like a security blanket. He learns then and there that there are are some problems that his ferocity can't solve. With Caine we are given very specific reasons for why he has turned out as he has. this is no the case with O-Dogg. We don't get a glimpse into his home life or his past. We know nothing about him other than what we see him do throughout the course of the film,or in the present tense. That such details of are left unexplored deprive him of any excuses that one would want to make on his behalf. He just simply is the way he is. This makes him all the more frightening, as does the fact that he is still a minor. His hair trigger temper and willingness to use violence give him a hardened exterior that makes it easy to forget just how young he is. Larenz Tates performance is not to be undervalued. His youthful enthusiasm helped him in the role. There is certain joyous ignorance that O-Dogg exhibits at his most violent. He takes joy in inflicting pain with childish glee. He lives like he hasn't a care in the world. It's that quality that makes his character, and by extension the entire film, a bit more challenging than it's sometimes preachy exterior would have you believe. Is O-Dogg truly a sociopath that needs to be locked away, or worse, put out of his misery? Is he such a black hole of humanity that he deserves death? Or is he, like Caine, a product of miserable existence? Is society to blame? Menace offers no easy answers save for one: the normally nihilistic Caine chooses life when faced with death. Alas, he makes this choice all too late. Out of this terrible twosome, O-Dogg is the last man standing, his ultimate fate revealed in a strobe like montage of brief images. He is being stuffed in the back of a squad car, hand-cuffed and on the verge of tears. So end the ambitions of a Ridah. *Special thanks to the imfbd for all of the great screen caps.